VISION QUEST cover art -- start to finish, so far. 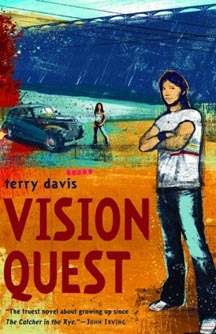 Terry Davis' first novel, Vision Quest (Viking, $8.95), is compared by John Irving, the author of The World According to Garp, to The Catcher in the Rye. There's nothing unusual about that; every American first novel narrated by a high-school boy in search of himself is compared to The Catcher in the Rye. The difference here is that the comparison is justifed; Vision Quest is a lovely little book, honest and funny and altogether true to life. It is, to begin with, a novel about people so thoroughly decent and attractive that one wants to reach out and embrace them all. Louden Swain, the narrator, is a high-school senior in Spokane who lives with his divorced father, an auto dealer, and who has two great purposes in life: to win his pivotal wrestling match against the formidable Gary Shute and to love his girl friend, Carla, with every ounce of his aching heart: "Having a serious girl friend is not all fun and games. There's responsibility in it." As he pursues those goals, he leaves the reader positively glowing. Understand, there's nothing saccharine about Davis' tale. To the contrary, his people are real and believable precisely because he does not sentimentalize or condescend to them. Vision Quest is about a boy who laments "the short time I've got left to be a kid," reasoning that "in a few months the greatest time of my life would be over," but who has the sturdiness and common sense to know it's time "to put the high-school part of my life behind me." There's none of Salinger's teen-age self-pity here; Swain doesn't resent adults—he likes and tries to understand them, because he knows that before long he'll be one himself. His goal—his "vision quest," if you will—is to be a good one. He also knows that before he gets to adulthood he has to pass the immediate challenge of adolescence, which in his case is to prepare himself to do the best possible job in his big match. Davis describes that preparation lovingly and exuberantly: the dieting to make weight, the long-distance running, the hard workouts in the smelly yet uniquely companionable wrestling room. The novel vibrates with the joy of sport and youth, of boys pushing themselves to whatever outer limits of excellence they possess. Their competition is tough but always friendly, their rivalries heated but never without respect. These kids are winners, and Carla is simply wonderful. So, for that matter, is Vision Quest. A few stills from the first film version of VISION QUEST. SONY ad campaign featuring a wrestling alien -- inspired by VQ? VISION QUEST'S next evolution -- TWILIGHT'S Taylor Lautner as Louden. "Davis is a wonderful storyteller...VISION QUEST is the truest novel about growing up since THE CATCHER IN THE RYE; and it's a better novel about wrestling and wrestlers than THE WORLD ACCORDING TO GARP." "Move over, Rocky. Here's Louden -- in a sunny and deft novel for lovers of wrestling, wit and hang-loose talent." 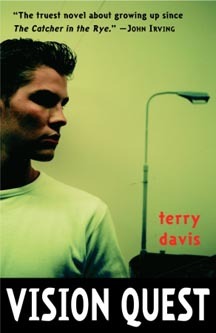 HarperCollins bestseller Meg Cabot must love Terry Davis's classic wrestling story, VISION QUEST because she mentioned it in her new book, PRINCESS LESSONS. Check out what Ms. Cabot had to say.